For the last few years, the drought-stricken nation of Saudi Arabia has been responsibly cracking down on thirsty crops to conserve water. But their cows still need alfalfa, one of the most water-intensive crops around. 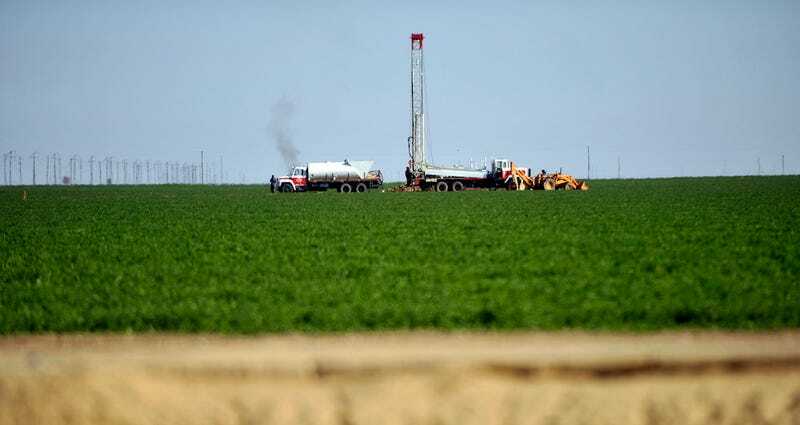 To solve the problem, Saudi Arabia wants to grow its alfalfa in a land that apparently has plenty of water: California. Wait, what? It’s an almost comical concept, and it’s all absolutely true. Due to climate change, Saudi Arabia can no longer support the growing of alfalfa, so it’s paying to exacerbate the drought in another part of the world. The Associated Press reports that the Saudi-owned Almarai dairy company has purchased about 14,000 acres of farmland in the Western US, enough to feed its 170,000 cows back at home. This is a particularly big land-grab, but the worst part is that this isn’t a new concept. Saudi Arabia, the United Arab Emirates, and China all grow tremendous amounts of alfalfa in the US. (Japan and Taiwan do as well, but it’s less about water scarcity and more because these countries don’t have as much arable land.) It’s been estimated that about 100 billion gallons of water per year is used to grow foreign cow-food. Yes, the US gets paid for these exports. But in doing so, this shifts the environmental burden to the US, where we don’t have enough groundwater in some parts of the country to provide basic needs for some of our most vulnerable residents. Why is the US such a great place to grow other people’s water-sucking crops? Because our government subsidizes agriculture in a way that many other countries do not. Which is great when you’re growing food to feed hungry Americans. But it doesn’t make a whole lot of sense when you’re using that land to grow foods that are shipped halfway around the world at a tremendous cost to the planet. In most countries just the looming possibility of running out of water would result in a drastic shift in lifestyle that might allow your citizens to thrive using less water. But when you’re deep-pocketed like Saudi Arabia, you just snap up some extra farmland, doesn’t matter where—or at what cost.